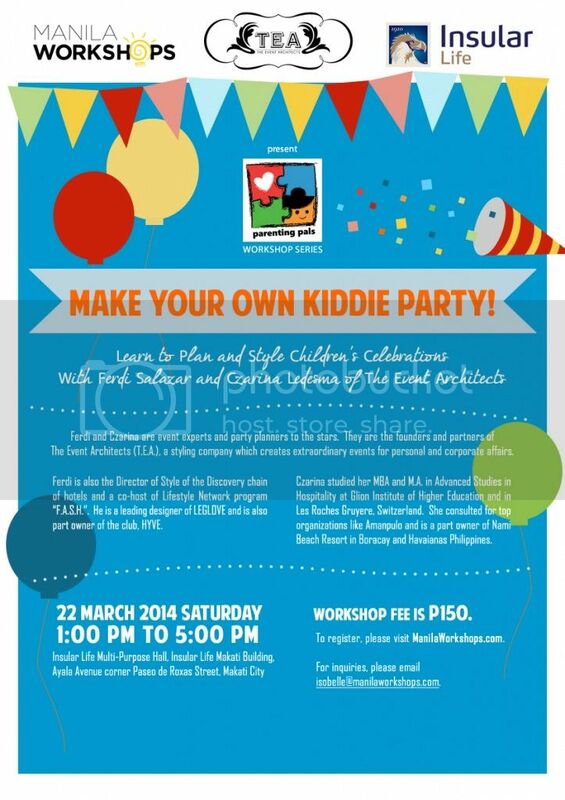 Press Release and Event | Manila Workshops: Make Your Own Kiddie Party! Before all the streamers, balloons, and cake icing comes a whole lot of planning. Join “Make Your Own Kiddie Party!” and learn to plan and style a totally personal and amazing event just for your child! A lot of clever tips, creative ideas, and practical advice will be dished out by our guest speakers, expert party planners Ferdi Salazar and Czarina Ledesma of The Event Architects. They will be sharing how to develop themes and concepts of children’s parties, how to organize a proper planning time table, and tips on suppliers and party paraphernalia, among others. There will also be a demo activity on creating a party centerpiece. And to make sure your party has your own personal flair, participants are encouraged to share with Ferdi and Czarina what their child loves – whether it’s blocks, trucks, fairies, princesses, and all – for great concept discussions and planning sessions during the workshop proper. Ferdi and Czarina are the founders and partners of The Event Architects (T.E.A. ), a styling company that creates unique, elaborate, and personal events for private affairs and commercial companies. T.E.A. has planned and styled the events of corporate clients such as Lancôme, Clear, Cosmopolitan, Yves Saint Laurent, Ralph Lauren, and Louis Vuitton as well as personal functions such as Sarah Meier’s wedding, a baby shower hosted by Amanda Jacob, and Tim Yap’s birthday. Make Your Own Kiddie Party! is on Saturday, March 22, 2014, from 1:00 PM to 5:00 PM at the Insular Life Multi-Purpose Hall, Insular Life Makati Building, Ayala Avenue corner Paseo de Roxas Street, Makati City. Workshop fee is P150. This workshop is the first installment for 2014 of the Parenting Pals Workshop Series and is supported by The Event Architects and Insular Life. Sign up now for clicking here.